With the whole Catholic faithful anticipating the first Apostolic Visit of Pope Francis in the Philippines, SKY FREE VIEW, available on SKYcable and Destiny Cable, brings every Filipino family the opportunity to witness each moment of this inspiring event. The focus of Pope Francis’ very first trip to the Philippines is to provide comfort to those devastated by Typhoon Haiyan and the Bohol Earthquake that struck the Visayas region in 2013. The Pope’s stay stretches from January 15 to 19, 2015, ensuring that the healing message of Christ reaches those in need. The Apostolic Visit’s highlight is a luncheon with typhoon survivors at the Archbishop’s Residence in Palo, Leyte on January 17. On January 16, the Pope’s itinerary includes a Holy Mass with the Catholic Bishops and Priests at the Manila Cathedral, followed by a Meeting with the Families at the SM Mall of Asia Arena. His return to Manila on January 18 concludes with a Holy Mass in Rizal Park, Manila. The faithful can watch the entire Papal Visit live, uninterrupted, and in high definition (HD) through SKY FREE VIEW. SKY FREE VIEW is exclusive to all digital subscribers of SKYcable nationwide and of Destiny Cable in Metro Manila. SKYcable subscribers in Metro Manila, Rizal, Cavite, Laguna, and Bulacan (San Jose del Monte) can view the live feed through CH 195 (HD) and CH 99 in Standard Definition (SD), while those in Baguio, Cebu, Bacolod, Iloilo, Dumaguete, Davao, and Gen. Santos can tune in to CH 702 (HD) and CH 22 (SD). Destiny Cable digital subscribers can catch the full coverage on CH 195 (HD) and CH 99 (SD). And before the Pope’s arrival, subscribers can also enjoy special documentaries about His Holiness on the same channels (SD) listed above from January 13 to 14. 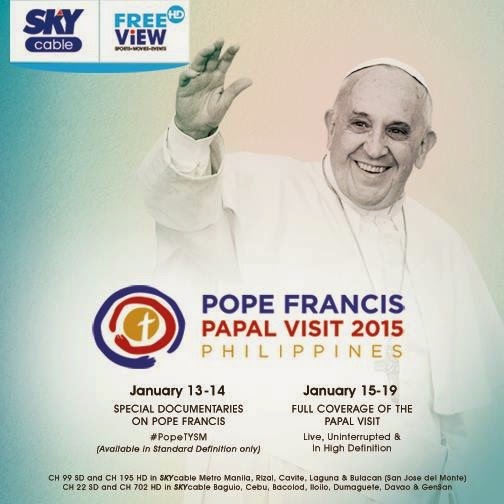 Aside from SKY FREE VIEW, SKYcable and Destiny Cable subscribers may also log in to iWant TV and watch the latest updates on the Papal visit and specials on the Pope on the PopeTYSM channel until January 25, 2015. iWant TV will also livestream the coverage of ABS-CBN, ANC, and DZMM Teleradyo during the entire length of the Papal Visit. With SKY FREE VIEW, SKYcable and Destiny Cable let you and your family enjoy real-time exclusive coverage of TV specials, sporting events, and live concerts right at the comforts of your home.